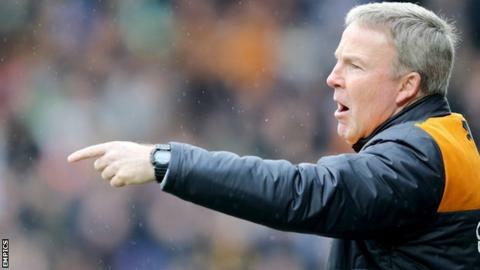 Wolves boss Kenny Jackett feels "hurt" by the "rotten run" that has seen his side almost certainly drop out of the Championship play-off race. When Michal Zyro scored twice on his home debut, in the first game following the sale of Benik Afobe, to help beat Fulham 3-2 on 12 January, Wolves were seven points off sixth place. But the gap is now doubled to 14 points after Tuesday's 3-0 loss at Brentford. "It's hard to take. First and foremost, it hurts," Jackett told BBC WM 95.6. "We deservedly got nothing. We didn't get hold of Brentford. The confidence drained out of us as the game wore on. We looked brittle at the back. And, in the end, it was a comfortable win for them, which is very disappointing, especially for the fans who travelled to support us." Admittedly, since Afobe joined Bournemouth, the up-for-sale Championship club have been left badly weakened by injuries to Zyro, winger Jordan Graham and Welsh international Dave Edwards - on top of season-long absentee Nouha Dicko. But having picked up just three points out of 21 in a winless streak of seven games, to follow four straight wins, Jackett admits: "It's been a rotten run." "It's a tough division," said Jackett, ahead of this Saturday's home game with Derby County, who were in the middle of their purple patch under the now sacked Paul Clement when they beat Wolves 4-2 back in October. "We want to make sure this group are as committed as ever and give them the confidence and backing." Asked whether his Wolves players looked committed enough at Griffin Park, Jackett added: "You come out and give an honest opinion of the game. I wouldn't say they didn't commit to it enough. "Every player intends to put on a good performance. But they will need all their character and determination on Saturday. "Brentford deserved to win. We didn't cause them enough problems. We weren't solid enough in either shape, 4-4-2, or 4-3-3. On Saturday (the 1-0 defeat at Huddersfield), I felt we were competitive but we just didn't do enough on the ball. Tonight it looked a disappointing performance." "After Wolves' limp showing at Brentford, the 13 remaining games feel like a test of endurance. Wolves have not had a drab mid-table season for some time and it is becoming an unpleasant experience. "Up until very recently, most of the ire from supporters this season seems to have been directed at Kenny Jackett's employers, rather than the head coach. "There are clear mitigating circumstances for him, with a long list of senior players either injured or that have departed since the end of last season. Most or all of them would be probably be starting if they were available. "The change of head coach now being called for by some supporters - and it is impossible to know exactly how many - would not solve that. "The important work Jackett has done over his three seasons at the club should not be underestimated. However, despite that, and the uncertainty over the club's ownership, Jackett will know that pressure from fans on the club to replace him will increase quickly if there are many more performances like the one at Griffin Park."